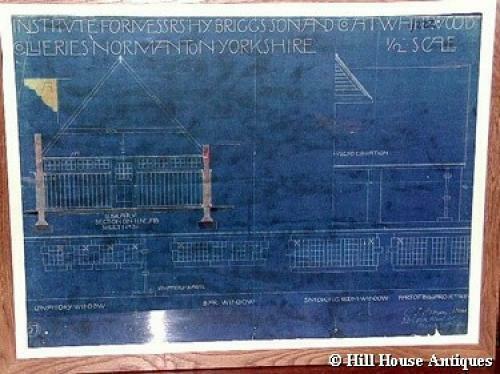 An extremely scarce, unique and original architectural working blueprint by the great architect designer CFA Voysey, signed and dated by him lower right. (apologies for quality of images - much better in the flesh). This is an executed design part of working drawings dated 1905 for the construction of a Miners Welfare Institute in Yorkshire. The building along with 19 houses was constructed by Pullans of Leeds and are grade 2 listed. The Institute is now a restaurant pub with a Voysey featured interior. The majority of Voysey drawings/archives were bequeathed to RIBA. Approx 33" by 25" inc frame. Has been gently cleaned (by a professional paper restorer) of any glue residues it originally had verso and backed on acid-free paper and reframed in oak under museum quality UV glass.